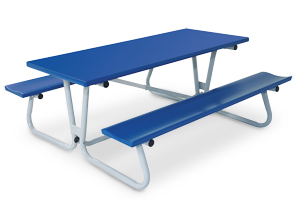 From its easy access slide through design, to the sheer comfort of its contoured seats, this 6' long folding picnic table has it all. Made of heavy gauge, high strength, heat-treated aluminum, and weighing only 87 pounds, it folds in seconds and is stackable for storage or easy transport to any location. Folding mechanism has a double push button lock which can be securely locked in the upright position. The main frame is 1.9" O.D. x .109" thick aluminum tubing. The diagonal braces are 1-1/2" tubing. Table frame is a powder-coated utility gray finish. The seats & tops come in multiple colors shown below.